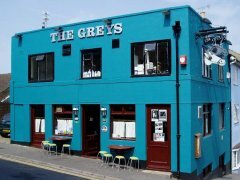 The Greys, Brighton & Hove, BN2 9UA. The Greys pub review, map and rating. Looking for a Hotel near The Greys? Large selection of beers (especially bottled) and good food. Is a small pub but regularly has decent live music. Generally for the more mature drinker.